The Oxford Paperback Dictionary & Thesaurus is a great value-for-money product. It is the ultimate one-stop reference, containing both a dictionary and a thesaurus in one handy reference volume. The dictionary and thesaurus texts have an integrated design which has been tried and tested with users to speed up browsing and look-up. The dictionary has excellent coverage of everyday English, containing over 90,000 words, phrases and definitions and incorporating the newest words and phrases from Oxford's language research programmes. The thesaurus provides over 100,000 synonyms and antonyms. 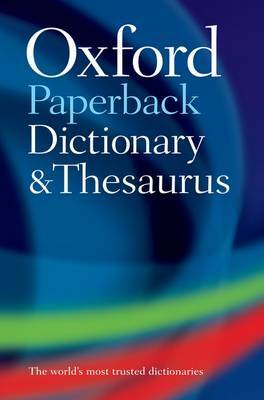 This handy dictionary and thesaurus is ideal for anyone who needs an affordable and portable, all-in-one reference work.